‘The Disciples of Lucas Cranach’ was conceived by Duncan Ward and Nicole Mollett in the wake of Cranach exhibitions at the Courtauld Institute and Royal Academy, the book gathered together seven artists all making works in response to Lucas Cranach the Elder (1472-1553). 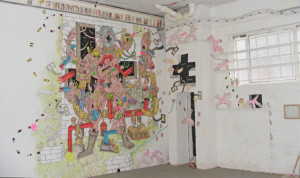 The exhibiton at Utrophia brought together the original seven artists who are joined by seven more to make the exhibition version of the project. The show expands the focus from two-dimensional in the book, to accommodate sculpture, installation, and live performance. Out of this multiplicity of viewpoints and approaches should emerge a rounded portrait of the artist Lucas Cranach, as seen five centuries after his death. Paul Westcombe, Adam Nankervis, Eleni Zagkali, Nicole Mollett, Duncan Ward, R.W.M. Hunt, Victoria McBride, Charlotte Warne Thomas, Christina Mitrentse, Lloyd Durling, Nadia Hebson, James Baxter, Jonathan Farr, Polly Huggett and Jonas Ranson.